For a while I’ve been focusing on making Time Bandit more presentable for various submissions to festivals and funding opportunities, and while the extrinsic motivation and deadlines certainly helped me in being productive, I’ve realized this hasn’t been a good thing in other ways. It never really seemed to affect my process on a conscious level—I would never let it impinge on the grand design of the game, and I still found myself spending a lot of time designing larger systems that no one would encounter without playing the game for a while, as well as mechanics and areas that wouldn’t be encountered until much later. But still, when designing for an audience that you don’t expect to play your game for more than a few minutes, you can’t help but try to stuff everything into those few minutes, which is entirely contrary to the slow pace at which everything is supposed to unfold in the real, final experience of the game. This is particularly a problem for Time Bandit since many changes that are made to make the game more what it needs to be in the end make it proportionately *less* playable for submitting it or showing it. Of course, computer programming is versatile enough that I can set up a switch that gets toggled for demo presentations, but honestly there are so many things that would need this switch as to make such a thing eventually untenable (or, at least, still a huge time investment that I’m not sure I want to make). So forget it. It’s time I focused on balancing the fundamental things like time and money (uhh…in the game). This has already led me to making some big changes, like extending the amount of time you need to sleep to fully regain your energy from 2 hours to 8 hours, and changing shift times from being a daily constant 4-hour period of time chosen by the player to a random weekly work schedule assigning an 8-hour period of time to each day at the start of each week. You’ll note that these are not only more realistic and hence more comprehensible to the player but also occur over much longer time scales. Both these changes occurred to me suddenly, not having previously existed on any of my numerous and quite unbelievably large to-do lists. If I can tie them back to anything, I think it was the feeling, after beginning to really think again about real-time pacing, that players should be pushed to play only once per day, or if more than once per day, then at widely separated periods of time, like once in the morning and once at night. I realized I had always been imagining it being played this way, but the idea was buried under more immediate, less important concerns. So this speaks to the importance of those shifts in process that don’t ever materialize in your to-do lists, no matter how myriad. Everything that you put into a work of art in the order that you put it there has a cascading effect on how the whole thing will turn out in the end, and lists seem like a way of staving off the aspects of that process that you don’t have full control over. It can be maddening to think too much about it rather than just allow it to happen. And maybe allowing it to happen is precisely the thing that you do have control over. Having been rejected from all the submissions anyway (the game is just too weird), it was a waste of time and, in some cases (*cough* BostonFIG *cough*), money (*coughing fit continues* despite accepting the game last year when it was in a deplorable state, somehow this year they just took my $60 without even playing the game or giving me feedback as promised). So I’m ready to be a pure artist on this project, not just in the way that I thought I already was, but fully at the level of process – giving the ideas the freedom to breathe and assert themselves whenever they will. I’m not against seeking feedback, and in fact the best time I’ve had with any indie game community has been since I recently started attending Playtest Thursdays at the NYU Game Center consistently. That’s because I actually allow myself to feel like it’s just a local community sharing their art. All the rest puts too many pressures on you that orient you toward iteration and superficial presentation, which is the territory of products, not art. It’d be nice for game development to be financially sustainable, but it’s not going to happen with this project. Or, at least, I don’t want to put any more effort into trying to make it happen until, like, launch. I think what I’m trying to get at is that games concerned with larger systems and games whose primary interactions are physics-based are equally material and deterministic, but the latter might shift the focus onto the graphical (which is, at bottom, just numbers) enough to cover up this reality with fantasy. Framed this way, it’s unsurprising that most of these games are about the player eventually overcoming challenges and winning, usually by smashing objects into each other one way or another. A more “realist” game, I think, would confront the deterministic formal qualities of games made with computers head on. I am almost at the point where all the main loops of the game’s systems are in place and where you can interact with those systems in real time over the course of many days with the time and money consequences set at their intended levels. Case in point: the hospital, where you go to heal, is now fully equipped to lock you out of the game for a certain amount of time. Next up is giving the player a daily wage (I’m not that evil) and, of course, putting them in jail (OK, maybe I am). All this work just to make everything noninteractive. Hope it goes well appreciated by the players. I’m afraid this will be the post that undoes me, shows me for the sham that I am when it comes to anything technical, which will end with me sticking to posts concerning game design only in the future. I’ve been rewriting the code that handles how unique story/tutorial events are triggered. There’s absolutely nothing new to see on the game’s surface, but at least now I can add new text to the game with no new code (how it should have always been) or, in cases where a simple check for whether a previous condition has been fulfilled is needed, minimal new code. Or, to be more precise, most of the new “code” gets embedded directly into the story text as my own secret language to handle a range of common scenarios: I have no idea if this is the proper way of doing things, but it works well with my process, with the sacrifice of some legibility. As a self-taught programmer, I have a hard time telling whether anything, like getting text into a game and figuring out when to trigger it, actually just takes that much or if I’m doing it the wrong way. The script is getting ugly—certainly the chosen symbols could use some work—I was running out of those that are readily available on the keyboard. It seems like that ugliness would have to happen somewhere, though, and by having it happen here, at least it’s all in one place and manageable if anything goes awry. (The code that interprets all of the symbols is, naturally, in the worst mess of all, but as long as it works, I can sequester it away and never touch it again, until of course I need to touch it again—OK, my next step should be to rewrite the interpreter.) It seems definitely wrong or at least unpleasant to write or copy/paste directly into Unity, so the external file is a must, and because events are triggered once the player reaches certain lines of text, it follows that functions should be called directly from here as well. 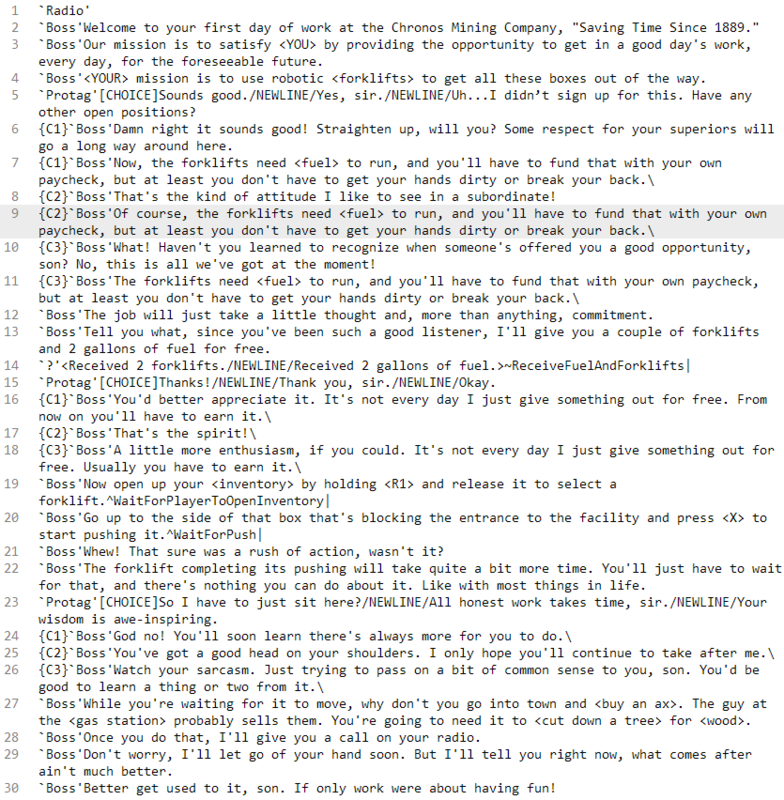 Doing all of this has helped me think about a few different ways I want text/story to be presented in the game (to be discussed in a future post), and setting that up will probably entail rewriting all of the code I just rewrote again. Ah, if only I had the foresight to know exactly what I wanted in the game, and if only I also knew all of the programming techniques I now know, and will know in the future, so that I could have written everything perfectly the first time and not currently be building upon such shaky foundations. Below you will find the current state of the puzzles in the game’s first level (except for the central mines puzzle, which … takes place in too large of a space to capture in a screenshot). If you’re worried that they look too hard, they probably are. But then, they’ll be too easy for some people. So rather than worry too much about what can’t possibly be balanced for everyone, I’ve decided to focus on integrating an optional hint system similar to the codec in MGS, which is IMO one of the best hint systems, because it disguises the fact that it even is a hint system by also being the main place for the player to go for exposition. Because you can pretend you’re just interested in hearing about the flora and fauna of Alaska or whatever, it doesn’t make you feel bad for using it, like you might if you went to GameFAQs, a defeated coward. I’m trying to remind myself that the content of these puzzles is on some level arbitrary. They’re essential as things for the player to do that take time and that focus their attention in particular ways, but them learning how to do *these* particular things – pushing and pulling boxes, compacting or burning trash, using a crane, and as of today, crawling through wires and turning on and off electrified floors – is only important to the extent that it will serve my larger goals in the type of experience I want them to have. Maybe then I should focus on making the game as accessible as possible so more people can have that experience; maybe I should set aside my attempts to try out all the nearly infinite configurations of box placement to find the most perfectly interesting situations. Because this type of “interesting” isn’t what I’m aiming for anyway. Sorry I haven’t responded to your letters in a long time (almost two years?). I’d like to say I’ve been busy working on a game all that time, and that wouldn’t be entirely true, but I was working on it part of the time. I’m excited to announce Time Bandit: Adventures in Search of Lost Time. It’s a real-time game that takes a very long time to play. Here’s a website with a whole bunch of GIFs: http://timebanditadventures.com. I hope to write you more often in the future. i startled and found my head perceiving something unexplainably unreal in something i can only call ”’some other dimension.”’ i met and befriended the beings there. they were all two happy too receive me, and adopted me into their family despite the discrepancies in our physical sizes. i tell you (listen), i lived out my entire life…—… i lived, and died, and when i awoke our website had loaded. what i decided was that it needed hills so i added hills. it’s actually surprisingly easy (and nerdyfun) to do things like this thanks to perlin noise. the next step is to mold it into a giant helix that illuminates in a fog of war style reminiscent of routezero (if i can pull that off even). i think there will be a rising tide mechanic that forces nomadic gameplay [but i hope to communicate that the perpetual movement is taking place only through time rather than at all through space– but if ppl are confused, or it’s not obvious, then oh well]. i want players to feel compelled to dive into the tide and destroy old structures they built in pursuit of resources.